Though Henrik Lundqvist usually starts for the New York Rangers, Stephen Valiquette knows how to shut out the Philadelphia Flyers in their own building. If Valiquette gets the call on Friday night, he will try to blank the Flyers (36-28-10) for the third time this season as they welcome the Rangers (39-26-9) to the Wachovia Center. In 24 career games, including 14 starts since 1999-2000, Valiquette has recorded two shutouts - both coming against the Flyers in Philadelphia. He stopped 20 shots in a 4-0 win on Jan. 31, then made 31 saves on Feb. 9 in a 2-0 victory. 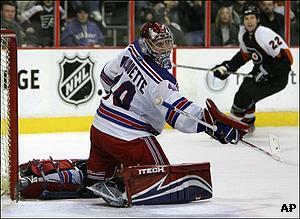 New York has won 11 of its last 12 games in Philadelphia, and is 6-0-1 there since a loss on April 15, 2006. Scott Gomez of the Rangers, who spent the first seven years of his career playing for Atlantic Division-rival New Jersey said a quick start always helps. "You have to take the fans out of it early," he said. Valiquette hasn't played since a 5-4 shootout win over the Flyers on March 2 at Madison Square Garden. After Lundqvist allowed three first-period goals, Valiquette relieved him to start the second and made 17 saves plus two more in the shootout. Lundqvist gave up five goals in consecutive losses to Florida and Tampa Bay last week that ended New York's 13-game point streak, but has bounced back against Pittsburgh and New Jersey - the teams New York are chasing in the Atlantic. He recorded his 100th career win in the Rangers' 5-2 win over the Penguins on Tuesday, then made 17 saves plus three more in the shootout en route to a 2-1 win against the Devils on Wednesday. Chris Drury scored with less than five minutes to play in regulation and Nigel Dawes tallied the lone shootout goal as New York improved to 6-0-0 against the Devils, closing the gap on the Atlantic Division leaders to four points with eight games remaining. Lundqvist told the Rangers' official Web site that picking up points at this time of the season is important. "You start to get a little nervous as the game winds down because you realize how important it is, the points are so huge," said Lundqvist, 5-0-0 with a 2.89 goals-against average over five career starts in Philadelphia. "You almost start to think that maybe it's too good to be true to beat them six times in a row." New York is trying to reach 40 wins in three straight seasons for the first time since a four-year run from 1970-74. The Flyers, meanwhile, are eighth in the East, one point behind seventh-place Boston with eight games to play. Philadelphia snapped a three-game losing streak by winning its 10th in a row over Atlanta, 3-2 on Tuesday. Mike Richards, Jeff Carter and Vaclav Prospal scored for the Flyers, who set a season high in outshooting the Thrashers 47-19. "We had some trouble winning games a couple of times this year, but we got the job done tonight," said Antero Niittymaki, who made a key stop on 50-goal scorer Ilya Kovalchuk in the final seconds to preserve the win. But both Niittymaki and Biron, though, have had trouble solving New York when playing in Philadelphia. Niittymaki has allowed 11 goals while losing his last three home starts while Biron is 0-2-1 with a 3.97 GAA in three starts since coming over in a trade from Buffalo in February 2007.